Garry Sibosado, Aalingoon (Rainbow Serpent), detail, 2018. Photo: Michael Jalaru Torres at Kooljaman Beach, 2018. 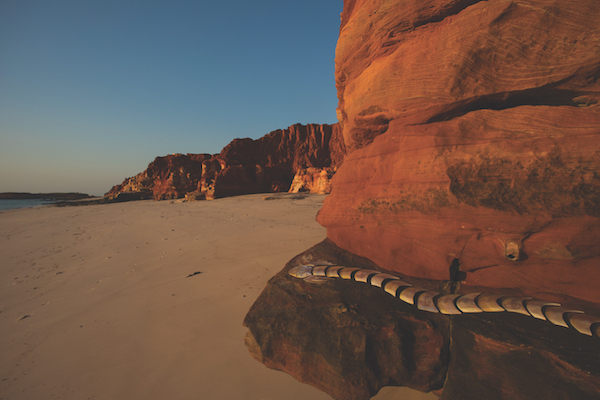 From February 2019, the Art Gallery of Western Australia will be taken over by Desert River Sea: Portraits of the Kimberley – the exhibition experience. This large-scale exhibition is the celebratory culmination of a six-year arts research project, Desert River Sea: Kimberley Art Then & Now, which tapped into the breadth and depth of artistic practice throughout the Kimberley region. Desert River Sea will include over 150 works from more than 50 artists, including works developed by six major Art Centres and three independent artists during the final year of the project.